Chilcote infroms Ian Todd that she read McCormack his Telex to Halstead/Frank about World Chess Championships. McCormack said to infrom them that Tudela is a "real chess nut" and that he thinks he might interest him on this. 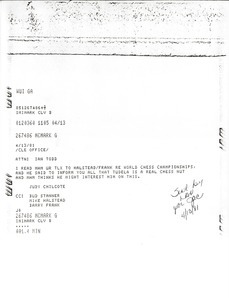 Handwritten note on telex reads, "Sent by LAH for JAC 4/13/81."